And so one of the theatre industry’s best kept secrets is blown wide open – Ivo van Hove is one of the most exciting directors in the world at the moment. I have been near-evangelical about his Dutch-spoken work for a while now (2 of his productions have been shows of the year for me) – booking six hours of Shakespeare here, four hours of Ingmar Bergman there, even going to Amsterdam to see his work with the Toneelgroep Amsterdam company he has so gloriously led for 14 years. 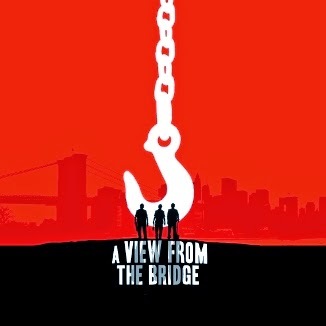 So it is a bit of a coup for the Young Vic to secure him for this production of Arthur Miller’s A View from the Bridge which sees him work with British actors for the first time. From the slow ris e of its beautiful opening to the excoriating tragedy of a final montage that will live long in the memory, this production simply confirms van Hove as a man whose theatrical vision is just extraordinary. Here, he takes an already magisterial play, strips it of all theatrical fripperies and pretensions, and distils it into a blisteringly acute psychodrama that is just devastatingly precise in its forensic detail. The experience of watching it in akin to taking a deep breath and then being unable to exhale until the very end, its interval-less momentum carrying the audience right through its two hours and it is hard to see how this will be beaten by any other piece of theatre this year. Tom Gibbins’ sound design is a masterclass in sustained atmosphere, alternating between relentless tip-tapping that is somehow so ominous and the subtly pulsing swells of music that build in operatic tension, suiting this community of Sicilian immigrants perfectly. Long-time collaborator Jan Versweyveld houses the cast in a metaphysical space, a bare thrust stage hemmed in by a low Perspex wall, in and around which they prowl barefoot as the frustrated sexual impulses of so many threaten to spill forth. Dress is largely modern, props are non-existent, all there is at play is the actors and their words yet the alchemical reactions here produce something spectacular. Mark Strong, tempted back onto the stage after over a decade away, imbues Eddie Carbone with a fierce raw energy, utterly driven by his convictions but haunted as the world refuses to fit into his worldview. He is consumed by his relationship with niece Catherine, something which teeters on the brink of wrongness as Phoebe Fox captures skilfully the moment of a young woman growing into her sexuality with neither quite managing to deal with the changes. Nicola Walker’s Bea, Eddie’s wife, is her own force of nature, full of earthy wit and determination even in the face of such obduracy, and Michael Gould’s painfully rueful narrator Alfieri is a desperately sad boyish figure throughout. With Luke Norris a powerfully effective Rodolfo – the scene where he is finally alone with Fox’s Catherine and they pour out their hearts to each other is just breath-taking, a perfect moment of drama – and Emun Elliott nailing the barely suppressed rage of Marco around whom the tragic downfall galvanises, it could not be better acted. And combined with the visionary talents of van Hove – the way in which he plays with the senses, even in the final moments, is an unexpected and thought-provoking pleasure – there can be no doubting this is something truly spectacular.